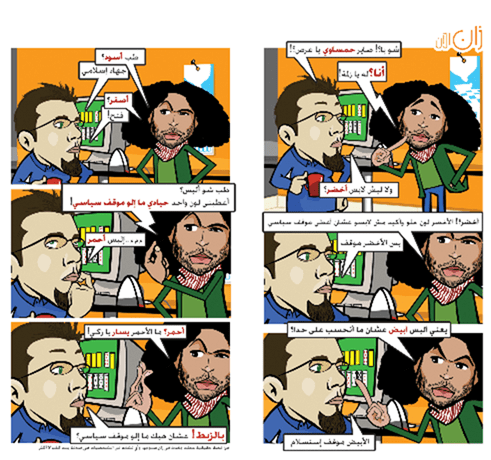 Zan Al ann means “Meanwhile…” It is a series of comic strips epitomising the famous Arab sense of dark humour. The language is rough-and-tumble. B: Have you become a Hamas groupie, you pimp? A little bit? G : Me? Why, my friend? B: Well, why are you wearing green? G: Green? The colour green is nice – of course I’m not wearing it to show my political leanings. B: But green IS a leaning. G: So I have to wear white to not be put in that box? B: White is a position of surrender. G: Fine. So what should I wear? Give me one neutral colour that doesn’t have a political position! G : Red? Red represents the left, smartass! B: Exactly! It doesn’t have a political view! From a true story that happened and happens in Zan studio. And any resemblance to the characters is nothing more than damn coincidence. Comics have been a rich source of political commentary, dating in English-speaking countries back to Punch. Inevitably, perhaps, a comic produced by a Palestinian creator will have very political overtones. This comic conveys a honed, funny, sardonic message. The English-speaking comic book audience is sadly missing out on Zan Al ann by reason of an absence of an ongoing, English-language version of this wry title.